Environics has had the privilege of being a part of TOXI-triage from the beginning of the project, since 2016. Our main aim has been to build a demo of a drone mounted CRN detector, and test its capabilities and limitations in operational use. The final test will be performed in public as a part of a large, joint exercise with multiple authorities in the heart of Mikkeli. Original piece in Finnish from City of Mikkeli website can be found from here. 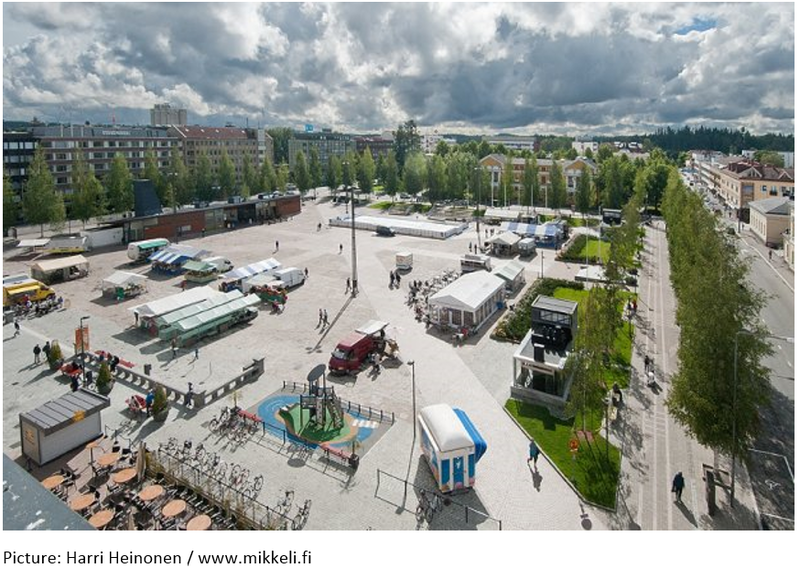 The center area of ​​Mikkeli will serve as the stage for the Disperse exercise, part of the international project Toxi-Triage, taking place on Wednesday, May 22, 2019. Over 300 people from the rescue services, ESSOTE Emergency, Defense and Police, and the Red Cross will participate in the exercise to test the technologies developed within the Toxi-Triage project and, at the same time, to improve the authorities' capacity to act in real-life crisis situations. On the day of the event, the main square area and surrounding streets will be closed for other activities. However, it is possible for the audience to follow the exercise on the edges of the area in individually marked areas. Large screens are brought to the area, in order to provide a close-up insight of the exercise activities. The exercise brings to Mikkeli a wealth of domestic and international security experts. The previous exercise of the project was carried out in Athens, in a closed area of ​​the Greek Air Force. - It is unique that such an extensive exercise takes place in the very center of the city, says Jyri Silmäri, rescue manager at South Savo Rescue Services. Silmäri continues that special attention is also given to multi-agency cooperation in Mikkeli, which is also admired internationally. South Savo Rescue Department and the Mikkeli Development Company Miksei Oy took responsibility for local coordination of the exercise. All the most important Finnish authorities, from the police to the Defense Forces, are taking part of the exercise. The exercise is part of the extensive international HORIZON2020 project. The four-year EU-funded project involves 19 organizations from eight EU countries. Finland is involved in the project with the South Savo Rescue Department, Mikkeli Development Company Miksei Oy, the University of Jyväskylä, Verifin and Environics Oy, a technology company in Mikkeli. The project develops and tests operating models, methods, tools and software for the control of CBRNE threats (Chemical, Biological, Radiological, Nuclear, Explosives). The main training session is on Wednesday 22.5. The South Savo Social and Health Services Municipal Federation ESSOTE organizes its own training, at the Mikkeli Central Hospital. The hospital organization is practicing the use of its new facilities and equipment for a poison gas leakage situation. Some of the tools of the Toxi-Triage project are used and tested in the hospital practice. Both exercise and the technologies used in it will be trained and tested on Tuesday 20 and 21 May in the campus area of ​​the Mikkeli Barracks. Monday and Tuesday events are not closed to the public. On Tuesday, there will also be an exhibition of equipment, including: Defense Forces and other participants’ technology, know-how and other equipment at their disposal. The Infantry Museum in the area will also be exceptionally open on Tuesday, May 21. On the same week it also takes place, as a separate event, the Final Seminar of the Baseco Project, funded by the Ministry of the Interior and Foreign Affairs. The aim of the seminar is to develop co-operation in the Baltic Sea region to combat the threats of radioactive and other dangerous substances. The seminar will start on Wednesday evening 22.5.2019. The seminar is conducted in English and is free of charge for participants, but requires prior registration."